Cats can be very fussy creatures, particularly when it comes to their toilet habits. If you get cat litter that they don’t like then you should watch out because you may find (as we have on a few occasions) that they decide to use the bottom of your babies pram or a pile of laundry as an alternative! Ensuring that your cat has the best cat litter that caters to their needs and that they like is crucial to avoid toilet mishaps. Here at Tuxedo Cat we have done extensive research into cat litter; what it’s made of, how it is made and all the boring technical details that you don’t really care to find out about when you are just looking for a something for your cat to poop in. This has allowed us to put together this list with reviews of our top 12 litter brands below. Our top 3 out of all of them are World’s Best Cat Litter (the best all rounder), Natures Calling (great for the environment) and Pettex Pampuss (best value for money). 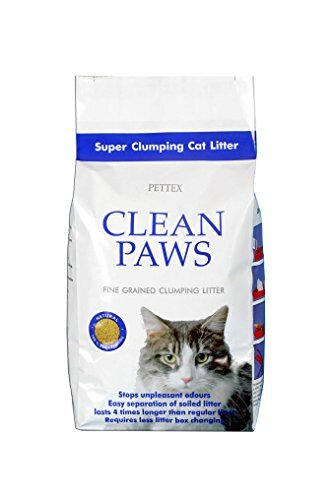 Alternatively, if you are specifically looking for either a clumping or non-clumping litter then skip ahead to the best clumping litter or the best non-clumping litter. Clumping cat litter is one of the more common types of litter available. It is very popular because it allows you to avoid completely emptying the litter tray for up to a month. This is because clumping litter sticks together when wet allowing you to easily scoop out the parts of it that your cat has urinated in, thus keeping it fresh and clean and removing bad smells. Clumping litter expands when wet so this can cause digestion problems if eaten (something which young kittens may try). While there have been no documented cases of any serious outcomes from a kitten ingesting clumping litter if you are concerned about this then you should wait till your kitten is at least four months old before introducing them to a clumping litter, instead start them on a non-clumping litter. World’s Best Cat Litter certainly aren’t shy when it comes to proclaiming how great their product is, that much is clear from the brand name alone! But what makes them think they’re so great and do cat owners agree? Great odour control! - made from whole-kernel corn it has a naturally microporous structure that keeps nasty odours inside the litter. Quick clumping! - trapping the liquid limits the wetness from seeping, sinking to the bottom or sticking to the sides of the tray. Easy to scoop! 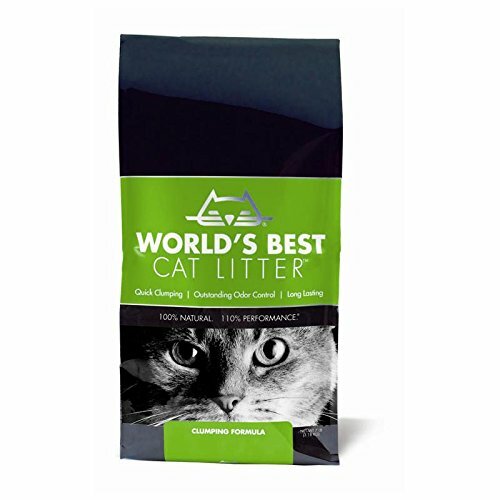 - with its patented formula and quick-clumping abilities, worlds best cat litter is easy to scoop. They use a patented method to turn corn (which is highly absorbent) into compact granules. Corn makes great litter because it contains millions of micropores which trap urine and bad smells inside them. Corn litter is also far better for the environment. Most litter is made from Sodium Bentonite, a type of absorbent clay, which is mined for cats. It’s not particularly sustainable or environmentally friendly, unlike corn production which is entirely sustainable and doesn’t cause harm to the environment. Unlike other clumping litters, you can safely flush Worlds Best Cat Litter down the toilet without fear of blocking up your waste pipe. This is because when the corn comes into contact with the water in your toilet it opens up completely and separates allowing it to be easily flushed. It won’t stick to the side of the litter tray and it doesn’t stick to your cat’s feet leaving trails of litter behind them as they leave their litter box. Another benefit of being made from corn is that you don’t get suffocated by the big dust clouds that form when you pour out standard litter. It is much lighter and far more efficient than clay-based litters meaning you don’t need to buy as much so won’t give yourself a hernia carrying it out of the cupboard! Worlds Best Cat Litter ticks all the boxes for me as a cat owner who wants environmentally friendly cat litter than retains bad smells and is easily flushable. However as with all cat litters it will be your cat that makes the final decision, this litter is quite different to all other litter types that your cat is used to it make take some time for them to adjust to it. With over 700 5 star reviews on Amazon, Nature’s Calling is a popular choice for cat owners who are looking for a natural, environmentally friendly cat litter. Made from the lining of recycled walnut shells it is one of the most environmentally friendly cat litters available. It is renewed annually, this means that their stock of walnuts are restored and replenished by nature within one year of them being harvested. It is very effective at neutralising ammonia (one of the waste products of urine which can create a strong smell). In fact, in tests, it outperformed clay, paper, wheat and crystal cat litters by well over 200%. It is a highly absorbent clumping litter. Lasts up to 30 days before litter needs to be changed. If the stench of your cat’s toilet visits are the bane of your life then what you need is litter which is specifically designed to prevent bad smells from escaping and filling your house. Thankfully that is exactly what Ever Clean does! It uses unique carbon technology to absorb and then lock in bad smells. It is made from very high-quality clay which is extremely absorbent and naturally neutralises ammonia and prevents the growth of urine odours. Many rave reviews talk about how when changing litter the old dirty litter still smells fresh and there is no trace of urine smell in it at all, instead just a nice fresh mellow scent! The clay is incredibly fine, this means that when you scoop you only take out the wet clumped granules and not loads of other stuff stuck to it, allowing it to last for much longer, allowing it to easily go for 2-3 weeks between litter box changes. Oko Plus is a woodern granule based clumping litter which claims to be able to absorb a massive seven times its own volume in moisture. The granules are made from fir and spruce wood fibres. These do a great job of absorbing bad smells and moisture and they are 100% biodegradeable, in fact they’re great for your plants so can be sprinkled around your flower beds if you want to or if you don’t have a compost heap. Cat's Best Öko Plus is a granule cat litter. Customers who have used this product frequently express their suprise at how long it lasts for compared to silica or clay based litter. It doesn’t produce any dust. It doesn’t stick to the litter tray. One downside to this litter is that it does stick to your cats paws fairly easily so will track quite a bit. This is a micro-granule clumping litter which is made from the world’s only known naturally occurring source of sodium bentonite (this is derived from volcanic ash) in Wyoming, USA. Despite being very fine it claims to be dust free, the micro-granule grains are also very good at minimising bad smells. This is because the grains are so small that it gives them a lot more surface area to absorb through than bigger grains have. Pettex Clean Paws can absorb more than four times its weight. It should last up to four times longer than clay-based varieties due to the efficient way the micro-granules are used which means that less goes to waste. Non-clumping litter is highly absorbent and can be made from a wide range of different materials including wood-chip, silica gel and more. The benefits of non-clumping litter are that it has much higher absorbency potential than clumping litter which means you don’t have to scoop out clumped urine everyday as urine will be thoroughly absorbed, only the cat poo will require daily scooping. Non-clumping litter is typically less efficient than clumping litter because it uses up litter much faster and will require changing more quickly. It also will often smell worse than clumping litter as you can’t scoop the smelly litter out easily. Bio Catolet is a trusted brand of paper-based litter which has been sold in the UK for more than two decades. The litter is environmentally friendly being made from 100% recycled paper which is turned into highly absorbent paper pellets. 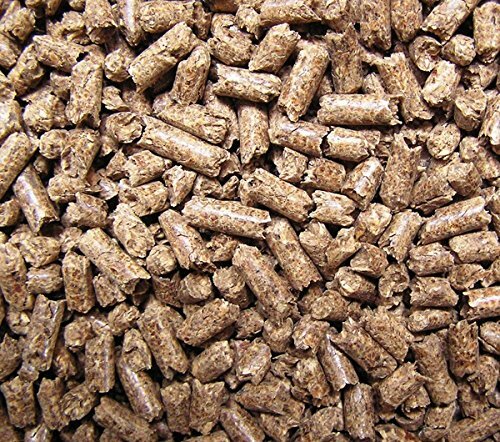 Bio Catolet gets as much as it can out of the paper by mulching and compressing it into densely packed pellets which are capable of absorbing over 250% of their own weight! It retains bad smells very well. It doesn’t stick to the sides of your litter tray. It is very easy to scoop out. It will not hurt your cats’ paws. It contains a vegetable-based flea repellent. It lasts for a long time with 12 litres lasting for up to 10 days and 20 litres lasting for up to 24 days. Subtle summer and winter scents. It is very light, weighing 60% less than clay and 30% lighter than wood occupying the same volume. It can be disposed of in your compost, burnt or deposited in your bin. 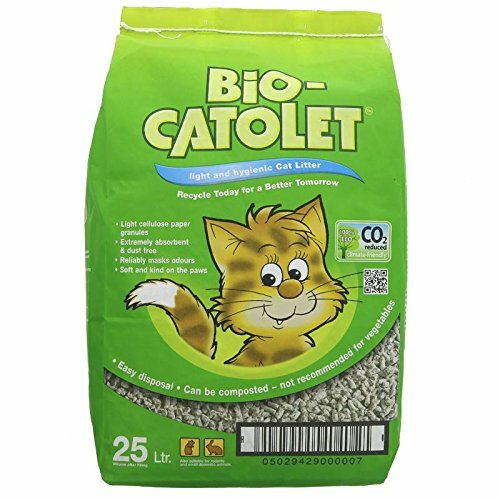 Bio Catolet is a great choice for someone looking for non-clumping cat litter which is environmentally responsible (it is made from 100% recycled paper and can be composted) and isn’t going to break the bank if that sounds like you then look no further! Bob Martin’s Felight cat litter consists of non-clumping antibacterial crystals which are made from silica. Silica crystals make great litter because they are biodegradable, produce less dust, are easily flushable and are non-toxic. They also do a great job of absorbing the stink of your cat’s urine and only need completely replacing once a month (if only one cat is using the litter). Bob Martin’s Felight is one of the most popular crystal cat litters available with over 208 five star reviews on Amazon (and counting). It works by trapping liquid inside its crystals, the liquid then evaporates while the bad smell remains locked inside the crystal. Fill the litter box with 3cm of crystals. Empty the tray at least once every month (based on usage of one cat per tray). Make sure you store the crystals somewhere which is cool and dry so that they do not absorb moisture from their surroundings which will inhibit it’s functionality. 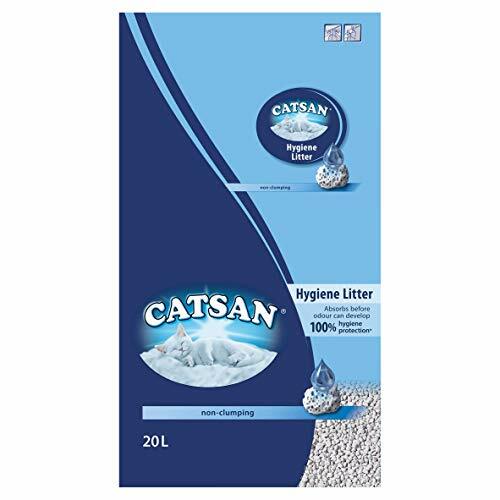 Catsan Hygiene is a very popular brand which is sold in a lot of major supermarket stores across the UK. It is a non-clumping litter which uses highly absorbent pellets which are made from chalk and quartz. It is particularly good at minimising the growth of bacteria. It also includes extra minerals which help to keep your cat’s litter tray better sanitised and therefore more hygienic. One downside to the Catsan is it does track quite a lot, we put down a small mat outside the litter box which captures most of the tracked litter and makes it a bit easier to clean up. Catsan litter will need changing at least once a week as it does start to smell fairly quickly. 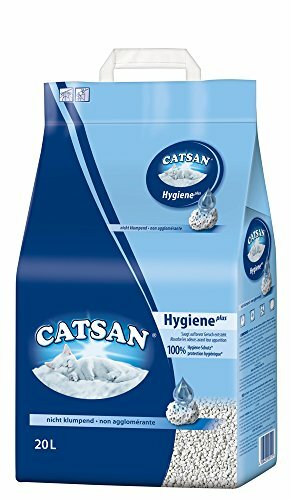 If you have a cat that has had problems with hygiene-related issues in the past then Catsan is a good option. Breeder Celect is non-clumping and paper-based. Which is perfect for any cat that suffers from asthma or has problems with it’s breathing. Dust is very common in clay-based cat litters, the dust found in clay-based litters is a serious cardiovascular irritant so you will need to ensure that you stay well away from them. Grain-based litter can also often cause allergic reactions and wood-based litter can be an irritant too. Instead, your best option is to stick with paper-based alternative litters such as Breeder Celect which do not create dust clouds when moved about. It has no chemicals, fragrances or any other additives in it. It deals with odour naturally through its highly absorbent paper. It is also good for the environment being made from 99% recycled paper. If you are looking for a cheap cat litter which doesn’t compromise on quality then you can’t go wrong with Pettex Pampuss Woodbase. It consists of non-clumping pellets made from 100% biodegradable wood. This is constructed from leftover wood shavings which are turned into pellets. Their pellets have no glue, fragrances or any other additives added to them instead they rely on the simple wholesome smell of fresh clean natural pine. Wood is a great product to make litter from because it is highly absorbent, great at managing bad smells and is very affordable to produce meaning the end product doesn’t break the bank! Pettex is a well-respected family run business which was established in 1959. They have grown to become a leading supplier of pet products in the UK who are devoted to ensuring that their products are high quality and meet the needs of their pets and customers. Pettex Pampuss Woodbase comes in 14.8kg bag measuring 50cm x 46cm x 12cm. Pettex Woodbase can be disposed of in your waste bin or it can be composted. 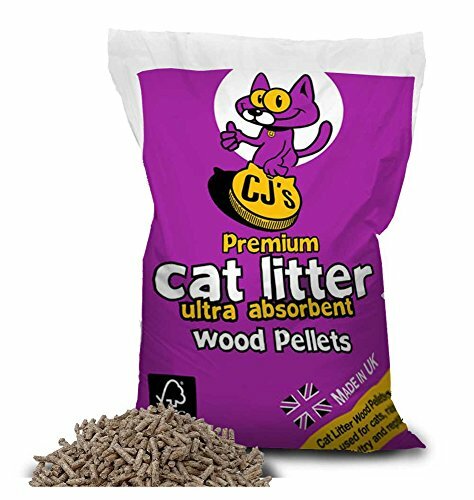 CJ’s Premium is a no-clumping litter made from 100% virgin pine softwood meaning it is free from contaminants, it is very soft underfoot meaning your cat won’t experience any discomfort using it. Virgin softwood is apparently one of the softest and most absorbent materials in the world so it works very well; boasting five times the absorbency of standard clay-based litters! CJ’s Premium is also antimicrobial which prevents dangerous bacteria from forming in the litter tray, this also kills off much of the bacteria that is responsible for bad smells. It is 100% biodegradable so can be easily disposed of in your compost heap, or put in your rubbish bin. 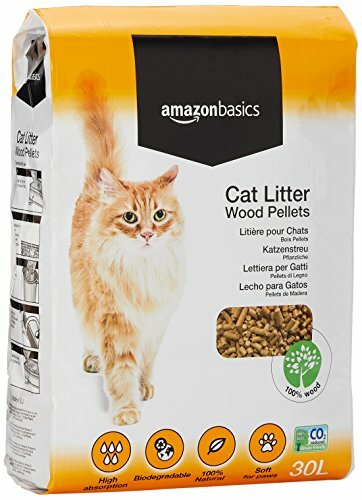 Amazon Basics is to cat litter what Asda Price is to groceries; very affordable and does the job well without any unnecessary extras. With over 95 five star Amazon reviews, this is a much-loved cat litter. It can absorb up to twice it’s weight in moisture, which is reasonable at this price point. If you are looking for a more absorbent litter there are plenty available which can absorb significantly more than that…though they are more expensive. Made from 100% recycled wood this litter is a great choice for anyone who is looking for cheap non-clumping biodegradable litter which is compostable. Cat are instinctively clean animals. They don’t require much training at all to use cat litter because in the wild they will always choose to go to the toilet in loose dirt or sand because this allows them to cover it up and mask the smell. So they will quickly figure out that the litter tray is the best place to go! It is important to be aware of this because if a cat’s litter starts to smell too bad then they will seek other places to go to the toilet to avoid the smell. Cat litter attempts to imitate the natural environment in which a wild cat would instinctively go to the toilet, however with the benefits of a plethora of additional functions such as anti-bacteria, clumping, super absorbency and more! The world of cat litter has changed a lot since 1947 when the idea of using sand was first conceived. These days there is a perplexing amount of choice and it can be easy to be unsure what variety you should get for your cat. The type of litter you should depends primarily on your cat and what they are happy using, we suggest you try a few different ones and see which works best for your cat. It also depends on what is important to you as a cat owner, is the litter being environmentally friendly and recyclable important to you? Is not having to clean the litter out so regularly a priority? Or are you more concerned about minimising bad smells and avoiding tracking? Whatever it is that you and your cat are looking for we are sure with a bit of testing you can find a great litter that works for you. This is one of the most common forms of litter in use. Made from Sodium Bentonite it is highly absorbent and will form heavy clumps when your cat urinates into it. It is great for getting rid of urine easily and efficiently and it is generally quite affordable. The drawbacks to using clumping clay are it is not recyclable, it can be extremely heavy and it can create a lot of dust so it is not ideal for asthmatic cats or asthmatic people. It can also be quite difficult to clean up the litter tray as it gets sticky when damp. Non-clumping clay is highly absorbent but does not forms big clumps when wet. It is easier to clean up the litter box when you are changing the litter as it is not as sticky as clumping clay. Some cats will prefer non-clumping litter as it does not stick to their paws the same, it is therefore a better choice if you want to avoid tracking. However it will start to smell much quicker than clumping litter as it is far harder to scoop out urine. This type of litter is made from little balls of silica gel. Silica is extremely good at absorbing moisture and is often used to keep moisture out of things like food, technology and medical products so it makes great cat litter too. Silica is dust free and controls odour very well because the silica gel traps the odour inside it. However if you cat regularly ingests their litter when grooming it may be wise to avoid silica gel as it can cause digestion problems if it is regularly eaten. 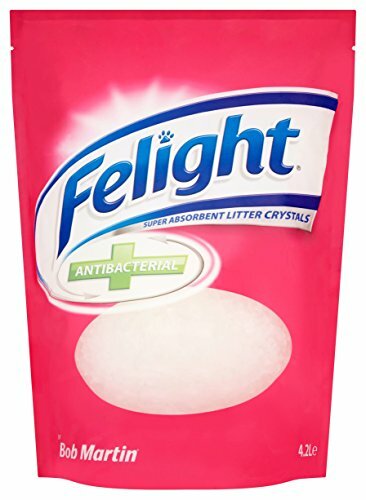 The best silica crystal cat litter in our opinion is Bob Martin’s Felight Antibacterial. Recycled paper is turned into small granules or paper pellets which are highly absorbent. Paper is also completely free from dust and 100% biodegradable, generally it is non-clumping though some finer paper granules paper litter may clump. 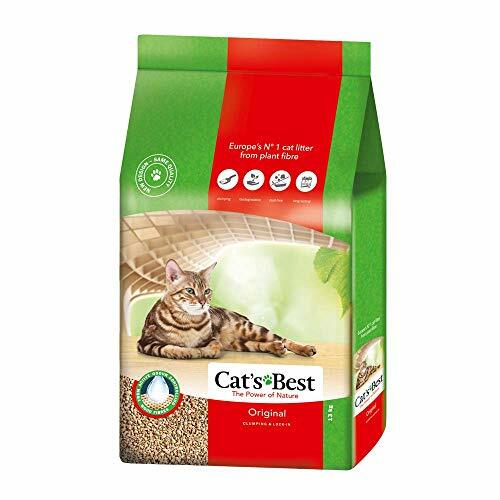 The best recycled paper cat litter in our opinion is BreederSelect. Pine litter is 100% recycled from leftover wood which is then specially treated to that all contaminants and things which could cause allergies are removed. Generally, pine litter is non-clumping but some of the finer pine litters may mush together when wet. Pine will require replacing fairly often but is good at masking bad smells due to its fresh woodland scent. The best pine cat litter in our opinion is Pettex Pampuss. This is made from crushed walnut shells. It is a clumping litter which is very effective at naturally reducing ammonia (the thing that makes urine smell bad) and can be left for as long as 30 days before it requires completely replacing. It is fully biodegradable and highly absorbent too. 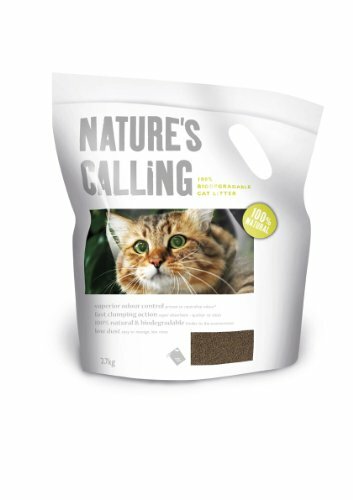 The best walnut cat litter in our opinion is Nature’s Calling. Cats usually take naturally to using their litter tray without much encouragement or guidance at all. Typically they will learn from their mothers while they are only a few weeks old. However a stray cat or a young kitten that hasn’t spent much time with it’s mother may not be familiar with litter boxes. Get familiar with your cats timings, if you know when your cat is likely to go to the toilet then you can ensure that they are near the litter box at that time. Play games near the litter box, cats will often go to the toilet after being physically active so playing with your cat near the litter box will encourage them to use it. Show your cat how to use the litter box, place them in it and scratch around in the litter so that they get the idea. A cat will quickly learn that the litter box is the most convenient and suitable place for them to go to the toilet so long as you ensure that you keep it clean. The recommended depth for cat litter is between 5-8cm (2-3 inches), however this will vary depending on what type of litter you are using. Most brands will tell you on the packaging exactly how much they recommend. Typically you should make sure that there is enough to allow your cat to easily cover their poop. If you know that your cat is a particularly vigorous scratcher who likes to do big deep scratches then it is a good idea to add an extra few centimetres of litter to prevent them scratching the bottom of the tray to bits and potentially damaging their claws. Cat litter getting everywhere (also known as tracking) can be very frustrating as it means you have to clean up after your cat every time they step into the litter tray! Make sure that the litter box is kept clean always. If it is dirty your cat will kick the litter around in an attempt to find a clean space. Try a different type of litter. Some litters track a lot more than others. A few examples of litter which doesn’t track are here and here. Use a litter box that has high sides, this prevents litter being easily kicked out. Use a fabric mat outside the litter box, this should help all litter rub off their paws sot you will only have to clean the mat, not the whole room! If you only have one cat then the litter should be completely changed at least once a week. You should check the litter every day to ensure it hasn’t become sodden and foul smelling, if it looks like your cat will have a hard time finding a clean dry place to do their business then it is overdue a change. If you have more cats then it may require changing every other day (if this is the case try getting a few more litter boxes). Some litters, such as this one and this one, claim to be able to last up to a month without being changed, as with all litters you still need to regularly scoop and inspect to make sure that conditions are still clean in there or your cat will quickly decide to go elsewhere. Dirty litter is something that you need to dispose of properly so that your home has minimal exposure to potentially dangerous bacteria. Non-Compostable litter should be disposed of in a waste bin. Make sure that you double bag the litter before placing it into the bin. This will reduce the risk of the bags leaking. Some non-compostable litter claims to be safe to flush down the toilet, as a general rule it is a bad idea to flush litter as this sends dangerous bacteria down the drain. Clumping litter should never be flushed as this will block your toilet and can be very difficult to remove. If you are using compostable litter then this can easily be disposed of in your compost heap. Dig a small hole in your compost heap and bury the litter. This will hide the bad smell which will reduce the likelihood of it attracting vermin and it will help it to break down more quickly. It is important that when you do clean out your cat’s litter tray that you do it properly. Failure to do it properly will reduce the lifespan of your litter tray and it will also allow potentially dangerous bacteria to grow which could make your cat very ill.
Use non-scented cleaning solution (something like Fairy Liquid is great) mixed with vinegar, the vinegar helps to kill off stubborn bacteria. Scrub the entire box and then rinse it out with warm water. When you’ve finished you should sprinkle a small amount of baking soda on the tray before refilling it with litter. This will help to neutralise bad odours and prevent bad smells from getting embedded in the box. Cat litter should be avoided by anyone who is pregnant. This is because cat faeces can contain parasites which can cause something called Toxoplasmosis which can cause stillbirth or defects such as blindness, deafness and more in your baby. If you have a cat and a dog it is important to be careful that your dog does not do the unthinkable and eat your cats waste. Unfortunately some dogs seem to find it irresistible! Best practice is to move your cat’s litter tray into a place which is completely inaccessible to the dog. This could either mean moving the litter tray somewhere which is too high for your dog to access or into a room which your dog can’t get into. f you have a small dog that can easily get through a cat flap then use a microchip cat flap so that only your cat can get through. If neither of these is an option then speak to your vet about getting adding a taste deterrent to your cat’s diet. These are completely safe for your cat to eat but make their poop taste so bad that even a dog wouldn’t consider eating it! Hey guys just want to say that after I read this I bought the world’s best cat litter clumping corn and I have to say it really is the best. I don’t think i’ll bother with any other ever again now. Hope they don’t go out of business lol! Good luck with it Doreen, I haven’t heard of many people (or cats of course!) being dissappointed with World’s Best! Can I just start by saying WOW! You really have put a lot of effort into writing this massive post on cat litter and you can tell a mile off you’re a great owner of cats and take great care when writing this content. There’s a lot of websites out there so it’s refreshing to see one of a higher quality. Hats off to you! Any way my question was which is the best cat litter for masking odours? In your opinion? Thanks for the support Kevin! 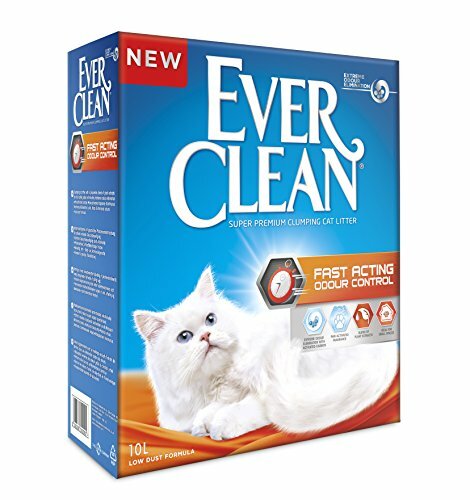 The best cat litter for masking odours would probably be the Ever Clean – which is our Best Scented litter. Hope that helps! Why Do Cats Use Litter?